This high-quality wooden bookcase exudes rustic charm that will make it a timeless accessory to your office or living room. 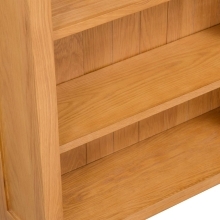 This stylish bookcase is made from high quality oak, which makes it durable and sturdy. The sturdy wooden bookcase requires a minimum of maintenance and the beautiful wood texture gives it a rustic charm. The library has 3 shelves, providing enough space to keep your collections of books, magazines and documents in a good order. With a simple but timeless design, the library can also be used to display decorative objects, photo frames, etc. Assembly is easy.